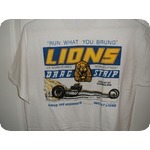 LIONS drag strip on a new extra large white tee shirt. 2 side print of this vintage So Cal raceway. This comes in other colors and sizes, email for more info.